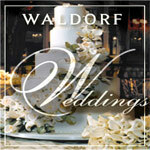 As host to some of history’s most noted weddings and engagement events, The Waldorf Astoria has garnered a reputation as a magical setting for weddings of all styles, large and small. An array of majestic function space provides a unique variety of settings. 38 world-class banquet rooms accommodate from 20 to 2,000 in renowned architectural style. Get more for your wedding! Don't forget to mention ChossonKallah.com when visiting Waldorf Astoria.